Swimming pools make happy families. Let us help you create memories to be treasured for years right in your own back yard. We’ve worked hard for many years to build a stellar reputation and strong referral-based business. You can leave your review and read lots of them below, or visit us on Facebook or Google to add yours or see even more! Brooks Malone is top notch when selecting a pool company. They worked with us to design the pool of our dreams while also making sure it will fit our back yard appropriately. They took the time to show us other pools so that we could be confident in our decision. We now have a pool that looks great and will provide our family with years of fun and entertainment. Their attention to detail and dedication to their customer makes them unique in the industry. Their crew is polite, on time, and hard working. We highly recommend Brooks Malone and have been doing so to friends and neighbors who have seen how quickly they work and what a great job they have done. Many thanks from the Jones family!!! Our Dream Pool- Created in 9 days by The Best! Thank you Brooks Malone! No, we aren't rich -one minister- Eric Heaton and retired teacher/ administrator and a daughter - Brittany who is scared of water but is so excited to get in her new pool because one end is only 3 ft and has a tanning ledge where she can sit in the water. We are finally overcoming her fear. She picked out this pool. God has blessed us in every part of this pool process and sent us Brooks Malone. God had his hand in every step from beginning to end. We thank God for this group who are not strangers but a group of people that we love! We realized Our Dream Pool today. Start to finish was 9 days in the pouring rain. Usual time is 7 days and you are ready to swim. We chose the fiberglass pool for many reasons, NO LINER, salt system.. no chemicals to mix and guaranteed. Love the night colored lights! Thank you Holly Brooks, David and the crew from Brooks Malone for your support and helping us realize a dream that we never thought possible. This group is the best, most professional, affordable, and caring swimming pool construction team we've met. #BrooksMalone #theBest #excited!!! Brooks-Malone were true professionals from the very beginning. From the first phone call Holly and her team were great to work with (even though sometimes I asked too many questions and tried to micro-manage). We can't possibly say enough about the quality of the work. A truly first-class team that is available before, during, and after the project is complete. We are new to pool ownership and we feel Brooks-Malone will be there for us should we have any questions or problems. If you have an opportunity to see one of their pools after installation you will agree that their work speaks for itself. David, Holly, Mike (our Project Manager) and their entire crew did a fabulous job. We immediately felt comfortable with them. So much so that our pool was installed while we were on vacation. They stayed in contact with us, sending us pictures and walking us through the entire process. We are first-time pool owners. We received a pool tutorial when construction was finished and they have continued to answer our questions since then. Our pool has exceeded all of our expectations. Every time we are in the pool my husband says, "I love this pool!" Thank you, David, Holly, Mike, and your crew for making our dream pool a reality. "The service is top notch and they back their products. Had two product issues and both were covered under warranty. Friendly and Helpful. Professionally installed. Went out of their way to address our questions after the install. Highly recommend! Very responsive to needs and requests. Our home and pool is absolutely gorgeous. David was able to take our vision and bring it to life. Holly and David were very accessible for any needs or questions before, during, and after our construction. We consider them dear friends! Thank you so much, we are so pleased to have you as friends! What can I say about Brooks Malone? They are awesome! When deciding on a pool contractor, we spoke to a few and Brooks Malone shined above all the others. They are a very professional group who take their jobs very seriously. Brooks Malone came to our home and in less than two weeks, we were swimming in our beautiful pool. It was amazing how quick they got the job done! Holly, David, and the crew were patient and helpful throughout the installation answering our many questions. Even now I know if we have any questions, they are just a phone call away. Anyone who is thinking about a pool, should contact Brooks Malone. They are the best! Of course, you can bet that the kids are some of our biggest fans when each new swimming pool gets put in! We treasure our time with family around the pool and hope we have the opportunity to help realize your backyard dreams. “I am sorry that it has taken me so long to send this, but my family and I can not thank you enough for helping us make a dream come true. The pool looks great and we have enjoyed it so much. My wife and boys have really took full advantage of it. We could not believe how fast the installation took. Scott did an excellent job and is a tremendous asset to your team. Mike has been such a pleasure to work with, any questions I have he is so prompt to answer. He is an excellent and knowledge sales person. We can not wait until next spring to utilize and enjoy the pool again. It was such a pleasure working with you and we would recommend your services to anyone. We look forward to working with you in the future. Thank you so very much and again you have made a dream true. “I just wanted to write you a note re: our swimming pool. I had intended to get this done long before now, but guess I just needed a cold dreary day to get me inside and motivated. Holly, I want you to know that Sam and I have been very well pleased with our pool and sod installation. We were reluctant to venture into a swimming pool again, but our experience with you and your staff made everything work out great. In years past when we had our chlorine inground pool it was so much work in upkeep and expense of chemicals required that it was exhausting – and that was when we were many years younger. Your consultation and recommendations were very much appreciated and with your knowledge and expertise, we felt reassured that we could manage and enjoy an inground pool with the grandkids. It has been one of the best things we have done for our family in a long time. The new salt water pools virtually take care of themselves which we could never have imagined would be so easy. We have had such a great summer with our new pool, the grandkids loved it and often wanted to have friends over to play in the pool; which we thoroughly enjoyed. “Choosing to put a pool in your backyard is a relatively easy decision compared to deciding on a company to install. However, repeatedly Brooks & Malone was the most popular recommendation and we have not regretted our decision. From the moment Holly and David arrived to our home they demonstrated their professionalism, friendliness, excellent customer service and knowledge. Sharing their knowledge and opinions made us feel more at ease when it came to choosing pool size, shape and etc. They were patient with our hesitance and uncertainty at times, but continued to reassure us of what would be our future ‘backyard oasis.’ We were updated daily on progress and what to expect on each phase of the pool. We absolutely love our pool and hot tub! Our backyard has been totally transformed and we will continue to enjoy for many years to come with family and friends! 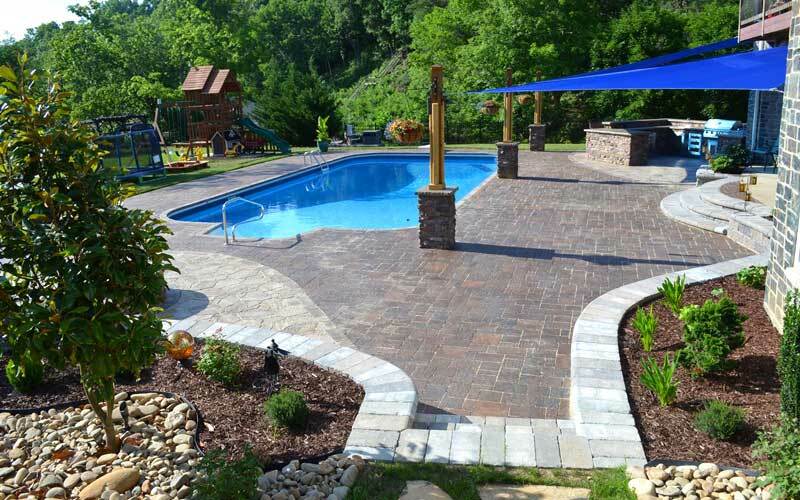 “As you know last year (2012) I decided to put in an in-ground pool at my home in Greeneville. I had no idea of what to expect during the construction phase of the project. I guess I was expecting a nightmare scenario of cost overruns, labor and material problems, etc. as would certainly happen in the Northeast where I come from. Nothing could be further from the truth. I had the good fortune to meet with David and Holly Brooks of Brooks Builders. From the very first meeting I liked this couple. I believe it very important for people meeting to discuss a proposed business venture truly like each other. Anything less would have been unacceptable for me. The pool construction started on time and was completed when promised. The workers were friendly and conscientious especially when it came to respecting my property and keeping it free of construction debris. Everyone involved was a dedicated professional. David Brooks was quick to respond to any concerns or questions I had. He also did some heavy chores for me at no cost. Whenever an expensive job is performed it is always a concern of mine as to “what if?” some things go wrong. We experienced some unexpected problems. My mind (and my checkbook) were very quickly put to rest as David and Holly stepped up and assured me “things will be put right.” Any problems were met and dealt with in a forthright manner. These people are driven by customer satisfaction. The final result is a beautiful ‘Lagoon’ swimming pool. Brooks Builders attention to detail left the pool sparkling clean with all equipment in good working order. “If having a pool installed seems like only a dream of yours, then contact Brooks and Malone where the dream can become a reality. Brooks and Malone will guide you through the entire process. Holly kept us informed during the entire phase of the installation. David and his team were on site during the construction where careful consideration was put into every step. They made sure of that. Keep reading more swimming pool testimonials on our second testimonials page.